Puzzle games are among the most played and popular games on our smartphones for sure. The genre is evolving consistently and developers have been finding new and exciting ways of teasing our brains, making us think, and stumping us entirely. Finding this type of game to test your puzzler skills while allowing you to enjoy exciting adventures is not easy. To make the search easier for you, we searched and discovered one amazing puzzle saga of two cool puzzle games. Let’s see what the game offers you. What are these games about? On this incredibly entertaining saga developed for android users, all players will be able to enjoy two different and highly exciting puzzle games, the shooter puzzle game and the match 3 puzzle game. Playing any of these two games is quite challenging and yet addictive, allowing players to enjoy the amazing HD graphics and cool sound effects while they try to progress in levels and go to their next puzzle adventure. Offering players many different levels with hidden surprises that they can win, players will enjoy each second spend playing these games and testing their puzzler skills. Why do we choose them? This saga for android players is divided into two different and equally exciting and cool for playing puzzle games, the Smoke Bubble and the Smoke Monsters. Players will have different tasks playing the two games and get the chance to explore the fantastic lands and adventures by solving each puzzle. The first game, is offering many fun shooter puzzles that needs to be solved in order for the players to pass with their magic monsters. This game is offering more than 100 levels, incredibly beautiful themes when playing and the option for the users to chance two colors of bubbles in their shooter. Just shoot and avoid the obstacles on the way! 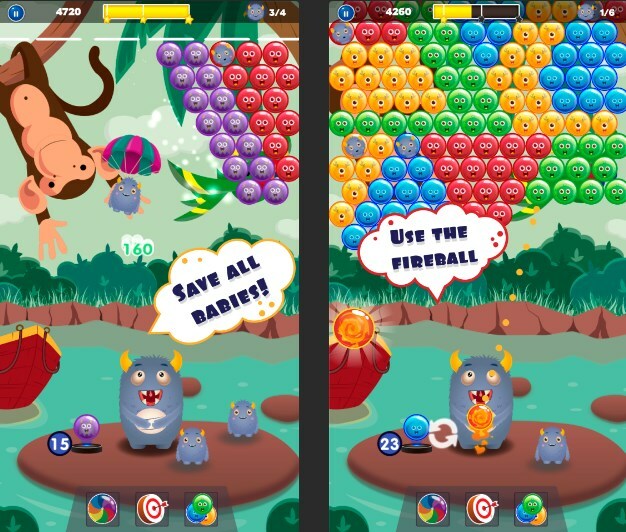 The second game is also offering high-quality graphics and designs, with many cute monsters and characters that the player must match and crush to progress. Each level is bringing the player different bonuses and the chance for the most skilled players to win blast combos to beat scores of others. All players in every level must collect foamy stars and use their chance to win the special prizes offered that can help them with unlocking even more exciting levels and adventures. Download this saga on Google Play for free and enjoy the fun puzzle adventures in the fantastic lands!